Well, that was a little scary. No major damage to report here. A couple of small things fell. But I've never experienced vibration like that in my life. How's that for irony? Several years in Southern California and the worst quake I've ever experienced was in Virginia. I thought it must be at least a 4 but it turns it was close to 6 at the epicenter; it was downgraded to 5.8 from 5.9 over the course of the afternoon. This was a fairly shallow quake and it was close to a minute before the rattling completely stopped. I grabbed my hysterical 9 year old daughter and stood in the doorway until the house completely stopped jerking around. But this isn't about me. I just find it a little odd that there were two quakes in the US of over 5 point magnitude almost exactly 12 hours apart. Late last night Colorado had experienced a 5.3 -- also very unusual for the region. The quake there centered in Trinidad was clocked at 11:46pm MT on 8/22. Ours, about 50 miles from here in Mineral VA was at 1:51pm ET on 8/23. That's a little too close for comfort in every sense. The one in Colorado was the strongest in over forty years. 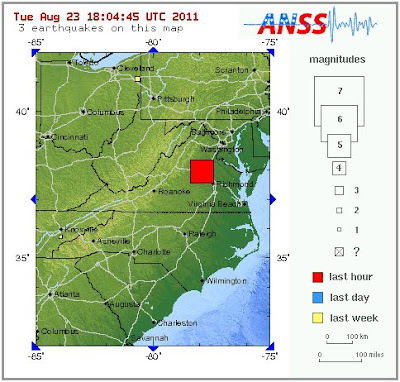 As near as I can tell, this was the first quake in Virginia of such magnitude in over a hundred years. There was another 5.8 in 1897. 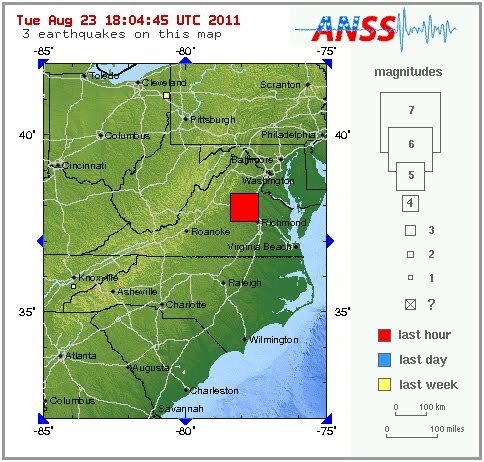 There've been a few of aftershocks in Virginia but I haven't felt them. The strongest was a 4.2 around 8:00 pm but I think they initially thought it was in the Charlottesville area because of the original posting which has been removed and replaced with one that puts it in Mineral. The other two were under 3.0. 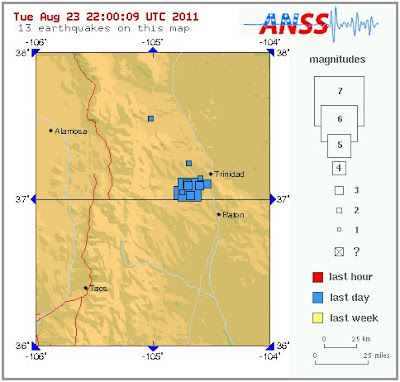 Trinidad, Colorado has had multiple aftershocks and there was a foreshock the day before of 4.6. As of this writing, I count 5 aftershocks above 3.0 in Colorado. Over the past couple of days I've been picking my way through the most recent interview with Time Monk Clif High. I still haven't listened to all of it because I just haven't had the time, but I'm going to post it now because this really jumps out. Last night I noted that there was mention of high potential for earthquakes. I just went back and listened to some of the earlier parts of the interview et voila. In the fourth video a little before the 5:00 minute mark, someone asks Clif if he still predicts two quakes for North America. The interview is from August 12 and he says he's still looking at a timespan from Aug 17 - 19, so as he typically is, he's a few days off. My ears had pricked up when I listened to that last night because I've been on earthquake alert myself for the past week or so. I just thought it would be in a more predictable location. I'm still concerned about California and noting Baja on my earthquake feed about daily; sometimes a couple of times a day. I had a fleeting thought a day or two ago that what I was sensing could be here but dismissed it. I've experienced quakes here before but they've been of the momentary jolt that feels like a truck hit the building variety. Again, with history as my guide, I did not expect a major quake in this area. Joke's on me. As ever, I offer up the Time Monk material without opinion on High's world view. He says things I agree with and things I don't... at all. In general, he's far more pessimistic than I am but I continue to be impressed with the technology he's developed for collating the collective unconscious. Turns out we humans, as a group, are fairly prescient. I noticed this on Time Monk George Ure's blog the other day, for interest. A helpful reader noticed that the webbot data pretty clearly predicted the "global rev" eruption in Great Britain. George, your comments and link Tuesday to the UK riots spreading and other stuff is right out of Clif’s Web-bot . He talks about the GlobalPop exhibiting “maniacal behaviour patterns”, and also for a really direct hit on his part – under the heading Tea Crazy – he writes:…”data sets have celtic isles as..center/focal point…of global revolution…British experience..provide emotional springboard…new subsets geographically tied to British Isles…long struggle against oppression/repression…challenges of mass national contention…fighting..displays as emotion…uncharacteristic of the national British character. So the webbots predictions continue to be impressive on the global revolution. While I was looking for that, though, I noticed something else from Ure that made me do a double-take. What Clif and I are both worried about it how these events (or eventlets to coin a term for them) may presage that yet-to-be-noted reports about people “staring blankly’ ‘going into standing stupors’ and needing ‘help of others to survive’ which would seem to fit with that could happen to someone whose mental constructs are not ‘light enough’ to accept that the world is sinking back into what in previous ages was called “magick”. They've been talking for a while about predictions of people just losing it and staring blankly into space. Here, Ure is putting that into context with a reader's experience of something I can only call a "reality glitch." It jumped out at me for a couple of reasons. One is that I've been noticing these "eventlets" or, to use my term, "reality glitches" for a while. I keep thinking I must be misperceiving but I'm less and less willing to say that. The other reason this statement caught my eye is that it echoes something I've been saying for a couple of years now -- that I see us entering a time of magic. I've been very reluctant to give details because what I see and sense... is just too weird. But I've mentioned it a couple of times; a quick search shows here and here but there are probably more. I don't know how George Ure means. I'm not even sure how I mean it but the future looks... surreal. UPDATE: I did feel another quake last night. It took quite a while for it to show up in the reports -- and some of the smaller quakes seem to have disappeared from the site -- but it was a 3.4 and it occurred 12:45:26 this morning. I have to say it was very subtle. If I'd been doing anything other than sitting in a quite room typing I expect I would have missed it... as clearly I did the 4.2 last evening. Can the WM3 Clear Their Names? BREAKING: Will the WM3 Finally Be Free? 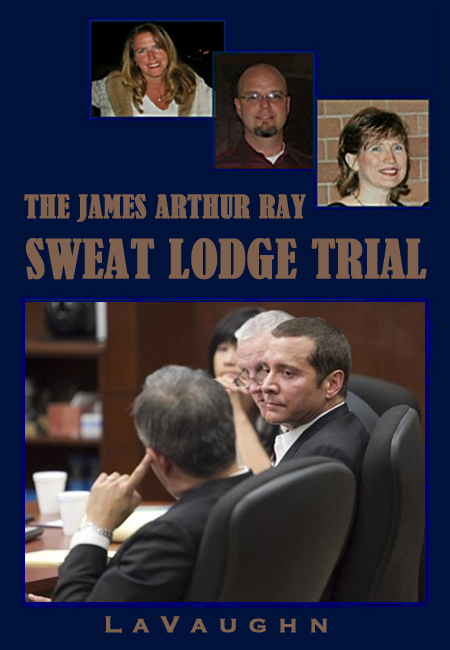 Will James Arthur Ray Get Off on a Technicality?